I watched a chunk of the LSU-UMass contest around lunch today. It was exactly the kind of game that belongs in that useless time bracket, and somehow I watched it anyway. What follows are some observations about teams you only tangentially care about. Keep in mind I know absolutely nothing about any of the players or coaches on these teams. There was one player in this game much taller than anyone else. He happened to play for UMass, and he was great on baby hooks inside four feet. 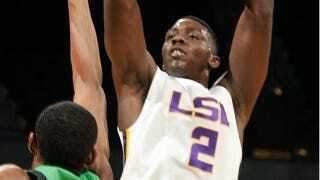 LSU has a guy, last name Mickey, who is a contender for the SEC lead in blocked shots. He had five for the game, and I watched him block a floater he had no business reaching. I have no idea how good he is, but as a 6' 8" freshman who can jump, he seems like he's going to be important to his team for a couple years. Speaking of floaters, mediocre college players seem to be really bad at them. I saw multiple shots in the 5-7 foot range that hit only one part of the rim or backboard. However, these turned into a multitude of offensive rebounds, so maybe that's a new coaching strategy? So much hustle. On one possession a UMass player dove into the radio section, and another loose ball chase ended with a player from each team going over the tables into the first row. The end of close college games can be a mess. Pressing, pull-up threes, and hysterical offensive rebounding were hallmarks of the last couple minutes. LSU closed an eight point gap to three in just twenty seconds by forcing two turnovers with their press, but Samson Carter hit four free throws for UMass to close it out. LSU has players with the last names Mickey and Hickey. There's a joke to be made in here somewhere. An LSU player hit a useless three with time almost expired to bring the final margin to two points. The original line was UMass -5. You do the math. Sorry, degenerate gamblers.